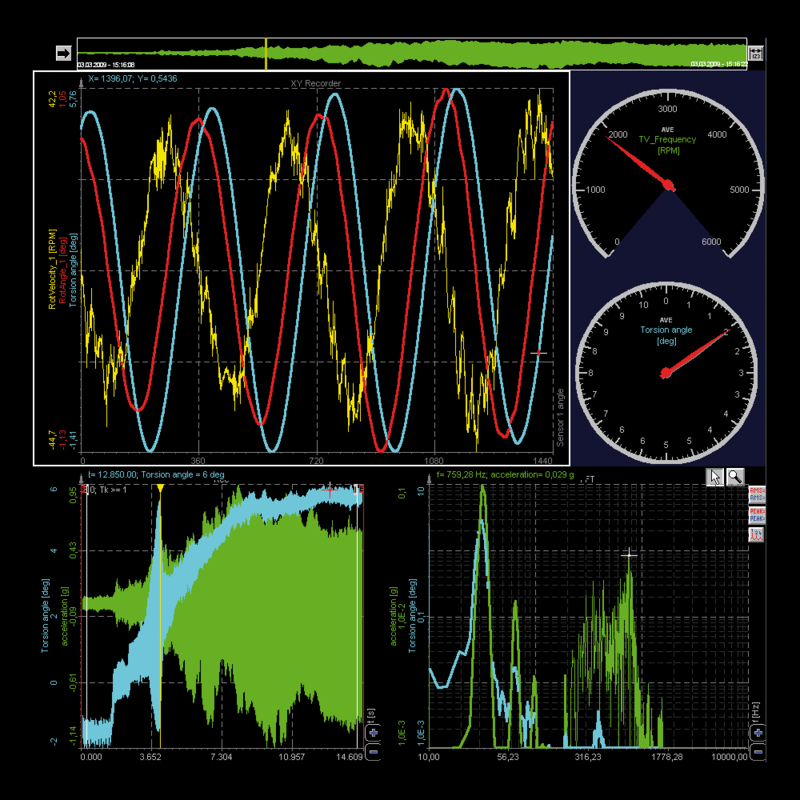 Dewesoft X offers powerful data processing capabilities for automotive, aerospace, power, and NVH applications in a single software package. 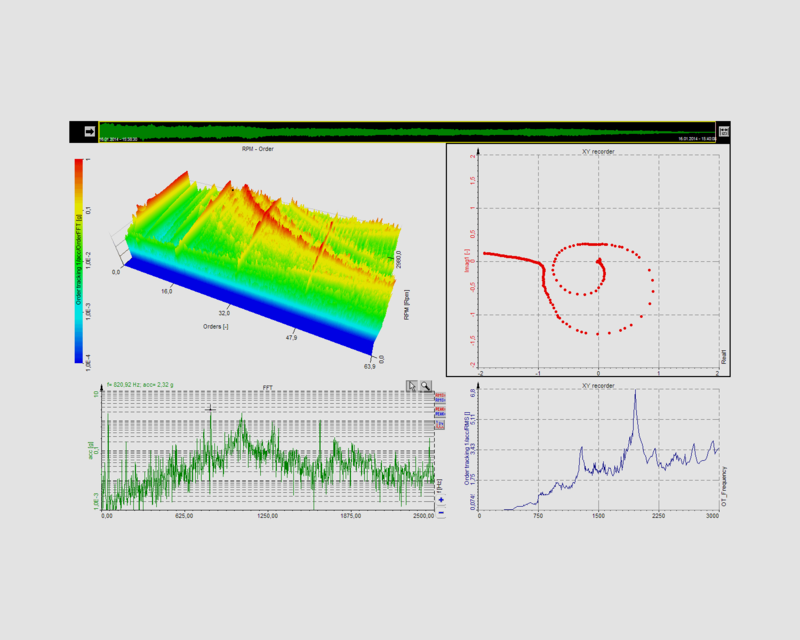 Dewesoft X software package offers extensive and easy to use mathematics library for data and signal processing. Mathematics can be applied online in real-time during the measurement or later in post-processing (offline). Dewesoft X will always store raw data from the connected sources. All mathematics applied to these sources will result in additional "virtual" channels. Original, raw data will stay intact. This allows existing and new math to be changed and applied later in analyze/offline mode easily. No more worries if you forgot to apply or your math was wrong during measurement. Now you always have the capability to change it at any time. 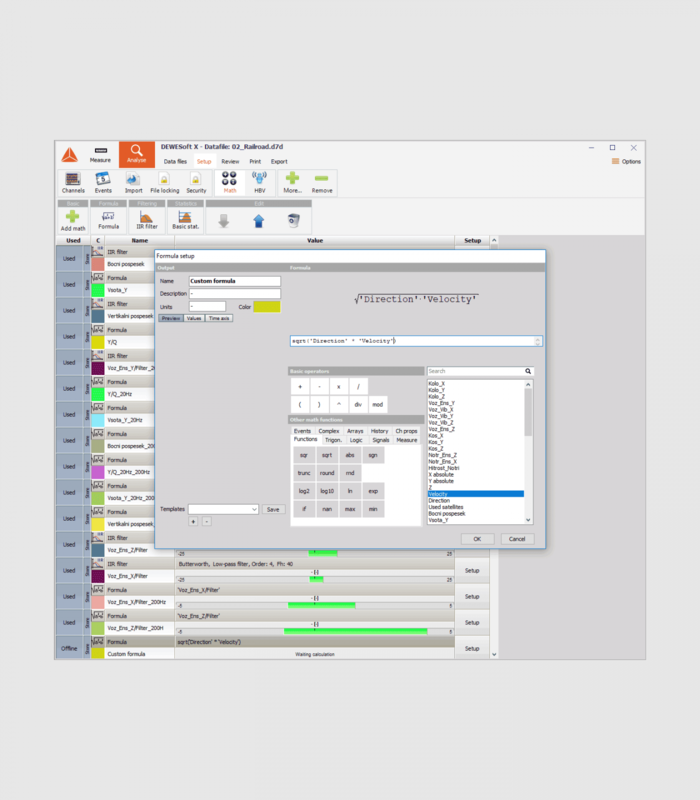 Formula editor offers all major arithmetic, logic, algebra and measure functions to be combined with one or more measured input signals or existing math channel to create sophisticated calculations. Includes measure, events and channel properties sections which can be used in calculations. Classical electrical filters like Chebyshev, Butterworth, and Bessel can be applied using IIR filter module. These filters also allow single and double differentiation and integration. When signals are filtered using standard FIR filter it introduces a phase shift. The output signal is delayed compared with an input signal. Dewesoft FIR filter is smarter and filters data without any phase shift or delay. This is perfect and can be used also for analysis of signals which does not allow having phase shifting or delay. 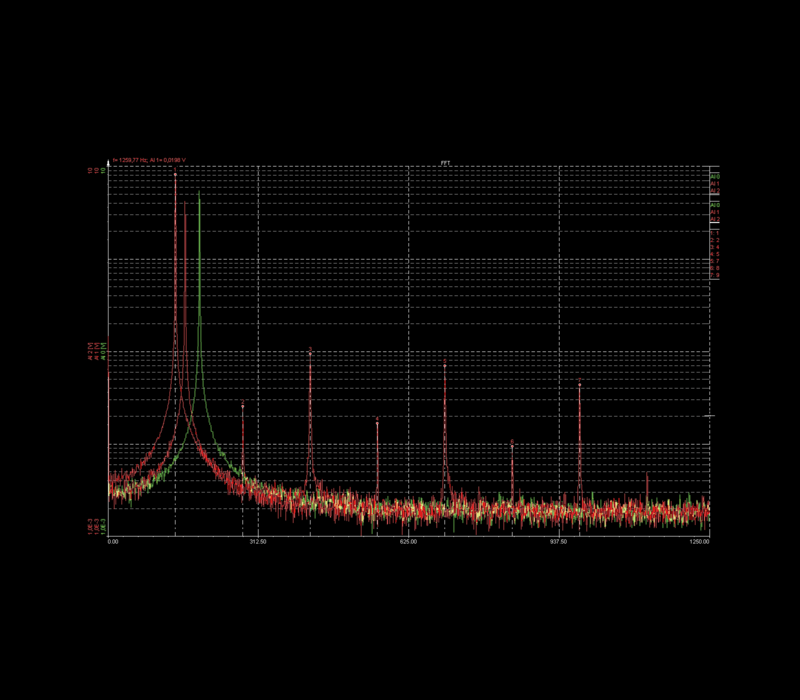 Frequency domain filter performs an FFT calculation and cuts a certain range of signal to create sharpest possible filtering. There are five basic calculation modes. Block based, Running, Single value, Triggered blocks and Start-stop blocks. Statistical function is selected as an output channel. 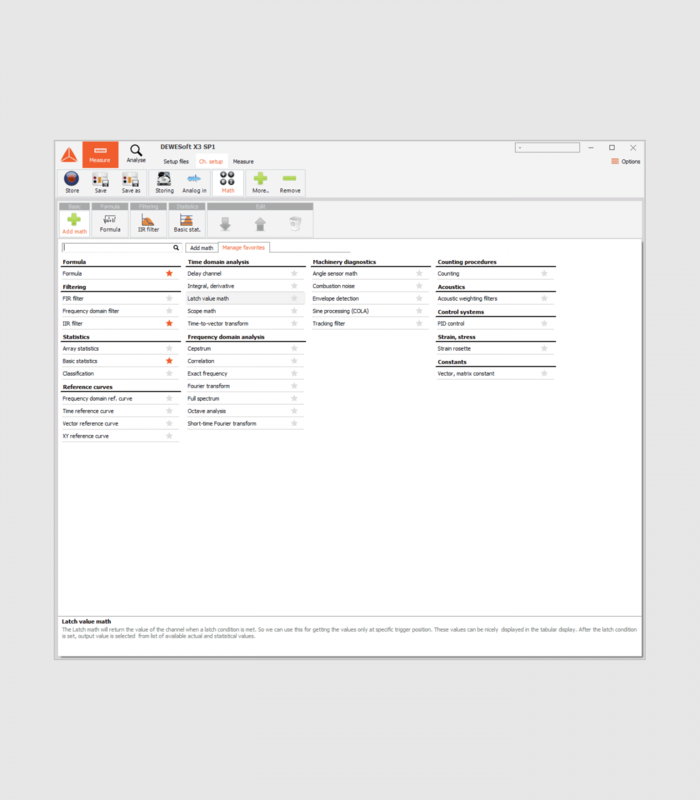 Application modules can calculate hundreds of application-specific parameters according to various standards, backed up with application-specific data visualization with a simple, easy to use user interface. With these modules, the user is only one click away from the total solution. 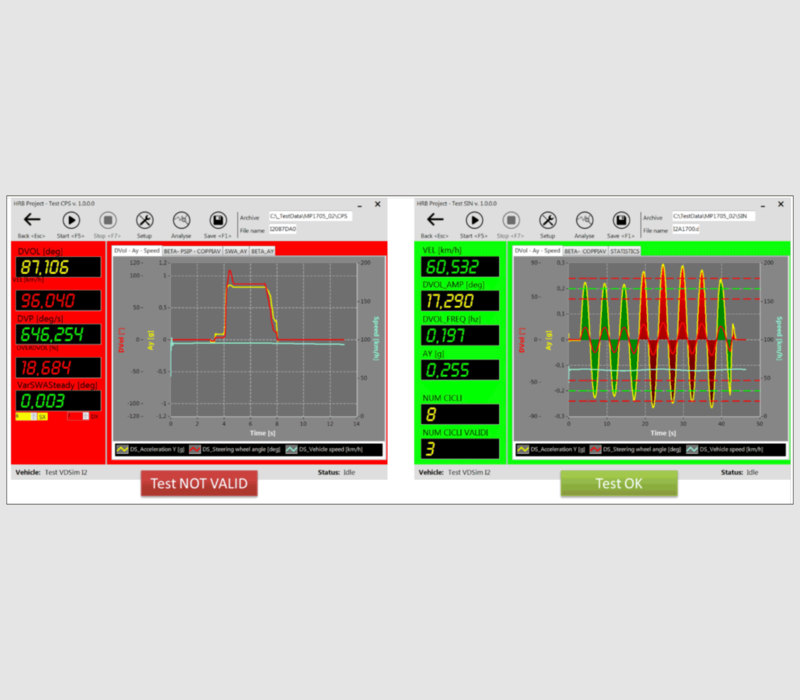 Power application module provides high-performance tools for calculation of power, harmonics, and related parameters. Together with our high-performance DAQ hardware offers a total solution for power analysis, power quality, E-Mobility and other power-related applications. The unique system architecture allows our solution to handle a couple of tasks within the same device. 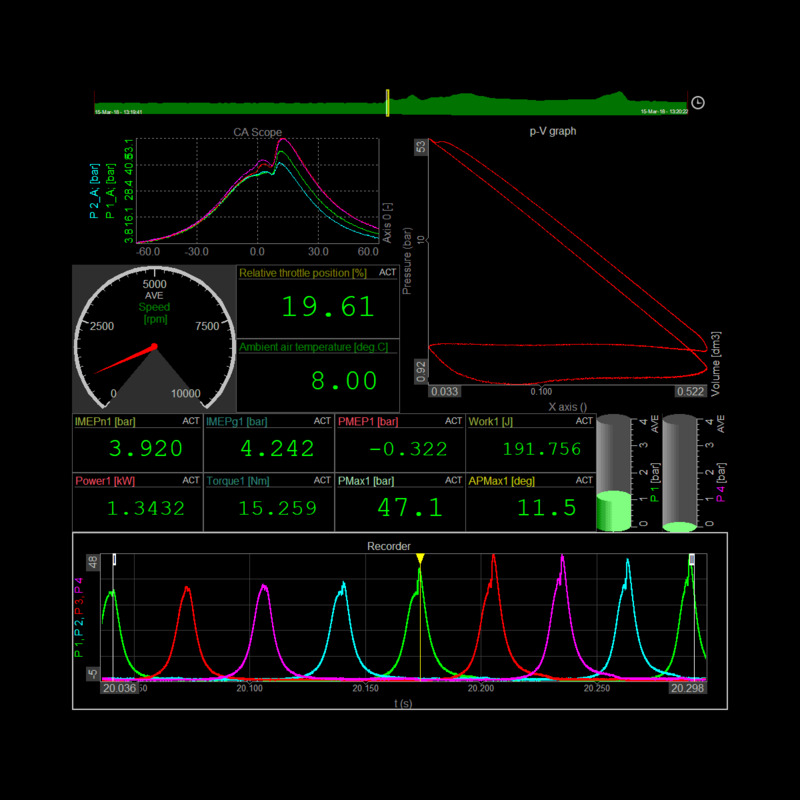 It combines the functionality of power analyzer, combustion analyzer, data logger, scope, vectorscope, transient recorder and an FFT – Harmonics Analyser. It offers acquisition of different signals (analog, digital, counter, CAN, video, ...) simultaneously storing them in a single data file. For more information visit Power analysis PRO training online course. For more information visit Power quality PRO training online course. 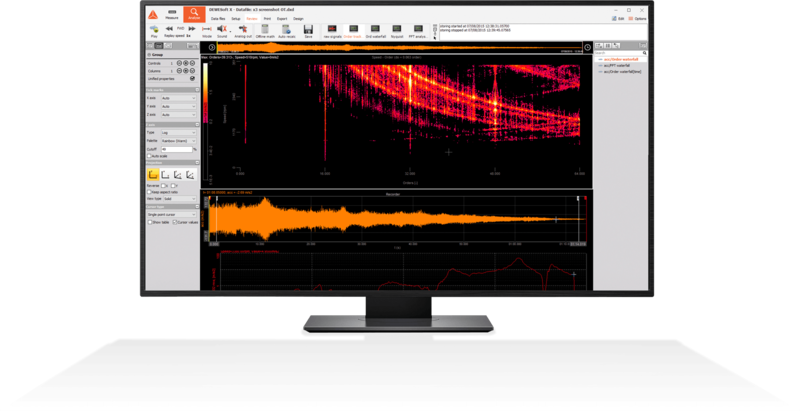 Software and hardware offer raw data storing with up to 1 MS/s. Scope and vectorscope views are also available. The same solution also provides very flexible and easy to use FFT analyzer. It is able to calculate and visualize harmonic FFT, full FFT, and 3D waterfall FFT. Recorder offer streaming of unlimited data and math channels directly to computers hard-drive with more than > 500 MB continuous stream rate. Triggering on analog, math or power channels is possible - e.g. trigger on voltage unbalance, frequency deviation, voltage dips, etc. Multiple cursors and markers: provide easy access to marked frequency values. Free, RMS, Max, Sideband, Harmonic, Damping markers are available. 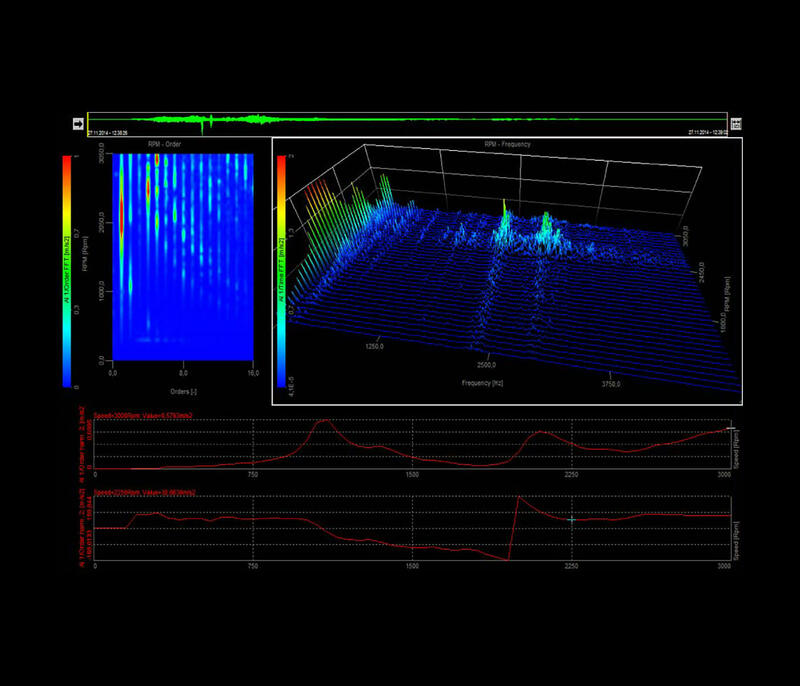 For more information visit FFT spectral analysis PRO training online course. Order tracking module makes it extremely easy to take time domain data and transform it into the angular (order) domain. It can extract any number of harmonics (amplitude and phase angles) which can be displayed in Bode, Nyquist, 3D FFT, real-time x-y and orbit plot. 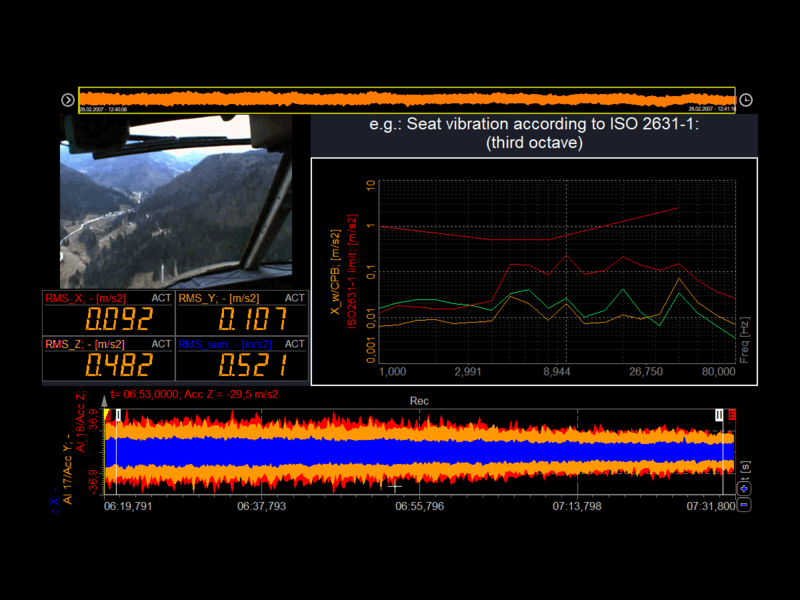 The plane view FFT clearly shows the excitation forces, natural frequencies, and all the resonances to give a clear picture of the dynamic behavior of the machine. Any input can be used: microphone, accelerometer and even the output of the torsional vibration module (see below). The patented digital counters technology (Supercounter®) provides very accurate and repeatable measurements. 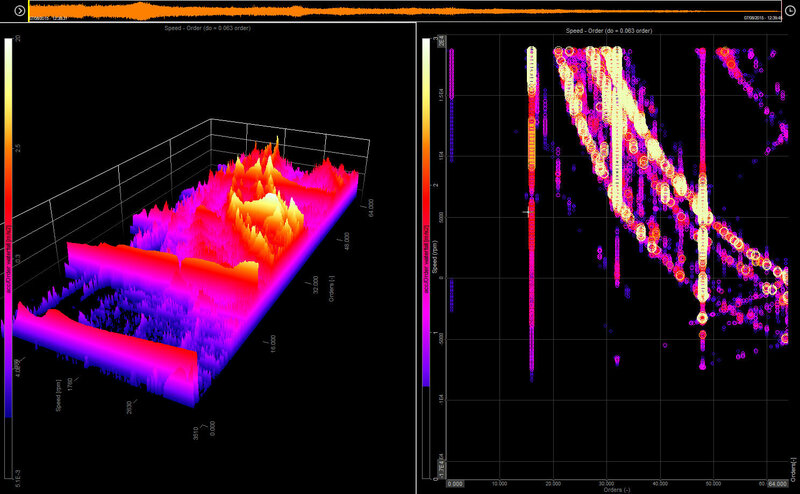 Results are represented on 3D color spectrogram and 2D graph for selected order and phase extraction over RPM. For more information please visit Order tracking PRO training online course. The module offers extremely straightforward and easy analysis of torsional vibration for rotating shafts, gearbox and similar rotating machinery. High precision digital counter inputs on our DAQ systems with the patented technology called Supercounter®, based on a 102.4 MHz time base, allows for exact measurement and calculation of rotational and torsional vibration angles and velocities at high RPM speeds from two encoders mounted on each side of the shafts. The difference between the rotations of each side is the torsion twist of the measured shaft. Constant angle offset, uncentered mounting and sensor errors can be compensated. Gearbox ratios are supported and additional filters can be applied. Several torsional vibration modules can be combined to analyse torsional vibration on complicated transmissions. The module provides an easy to use tool for single and dual plane balancing to cancel out the vibrations caused by the first order. The setup itself is very simple. Connect the angle and vibration sensors. The module will guide you step by step trough balancing procedure. First record the initial run, then add a trial mass at the appropriate angle. Steps can be repeated if required. All results and the raw data are stored in the data file. 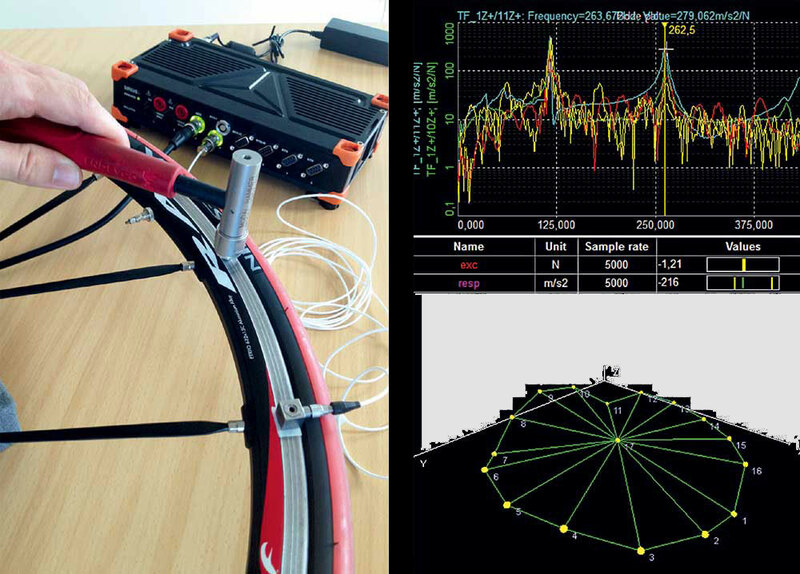 For more information please visit Field balancing PRO training online course. 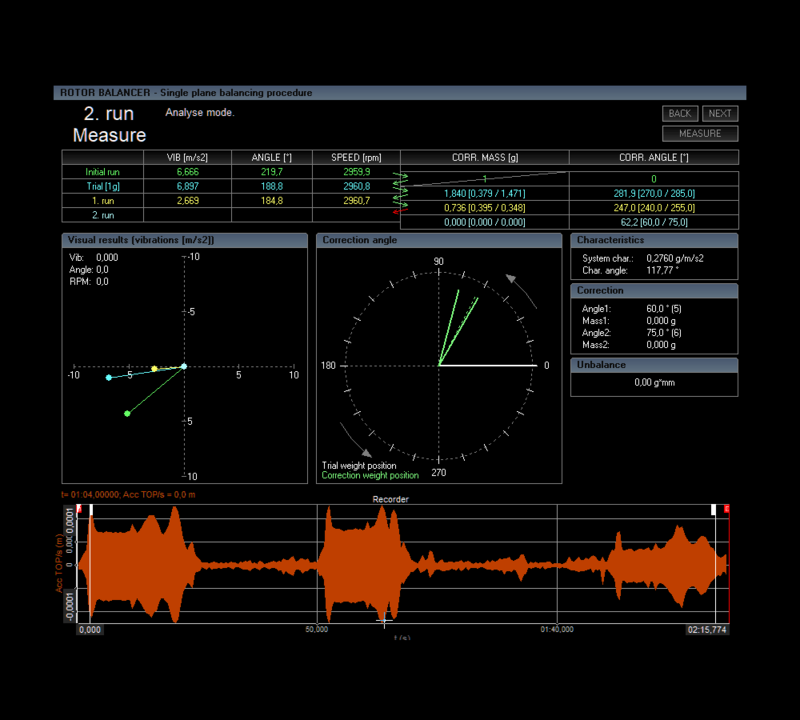 FRF and modal analysis module can measure transfer functions of mechanical structures with impact hammer or shaker excitation. The software allows to draw or import the structure geometry for quick visualization of measurement points. The chosen natural frequencies can be observed as an animation of the structures. 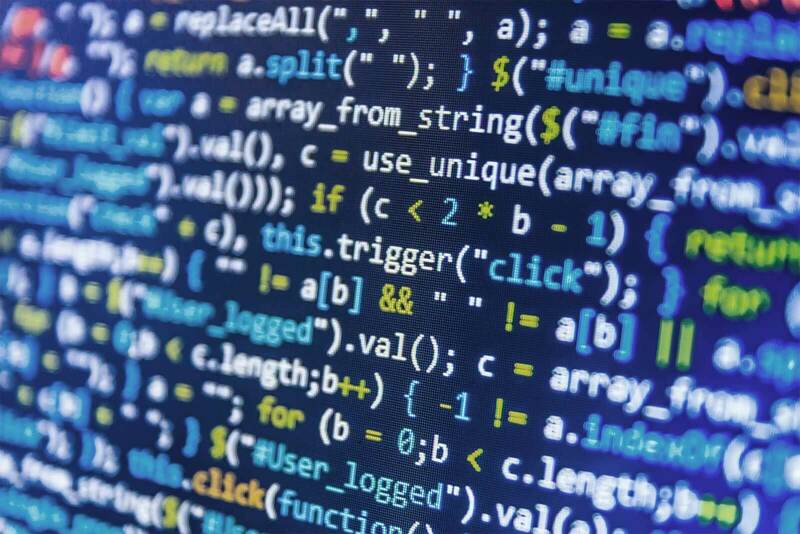 Measured data can be exported to UNV files and easily imported for further analysis in other software packages. The same module can also be used to define transfer functions of electrical circuits like amplifiers or filters. For more information please visit Modal test PRO training online course. 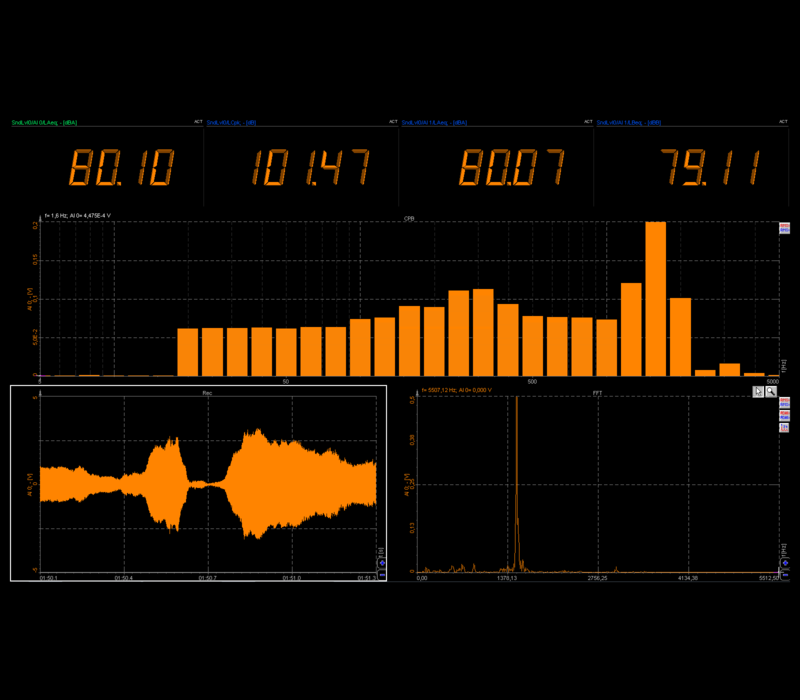 Sound level meter module can calculate typical parameters for sound level measurements from a single microphone. The solution can be used as the typical sound level meter with A, B, C or D weighting. With our high dynamic 160 dB dual 24-bit SIRIUS DAQ systems it can easily fulfill all the requirements for Class I sound level meter. 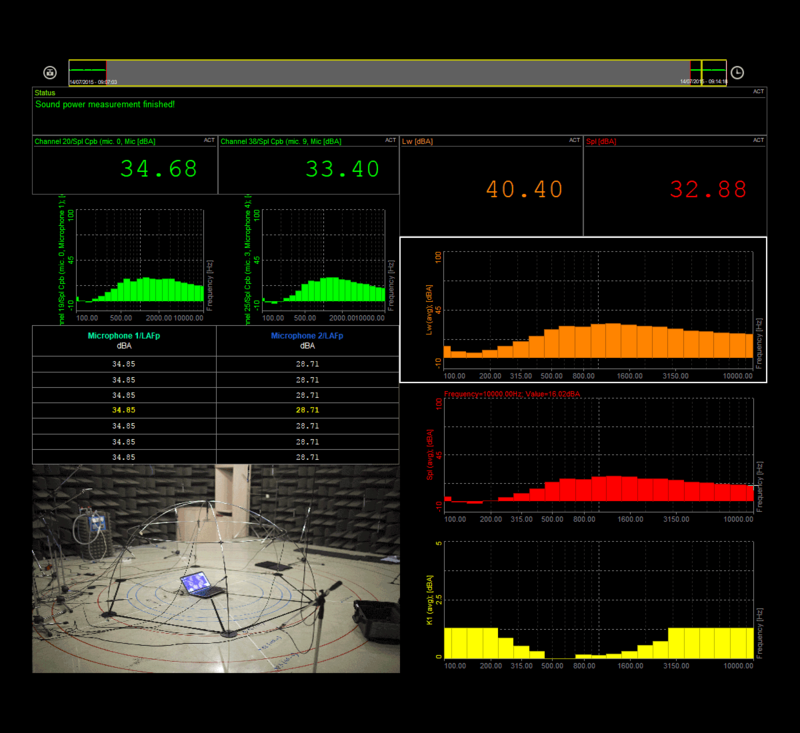 The module provides real-time sound level calculations according to the international standards IEC61672, IEC60651, IEC60804. Any combination of frequency and time weighting can be calculated. The statistical values are calculated over the whole range or with the custom specific entered block size. For more information please visit Sound level meter PRO training online course. Sound power module supports measurements according to the ISO 3741, ISO 3744 and ISO 3745 standards. The microphone positions are calculated by the software, depending on the size of the sound source and configuration (hemisphere, parallelepiped, ...). If there are fewer microphones available than requested by the standard, you can build groups and change the position during the measurement. The user is guided through the measurement step by step. 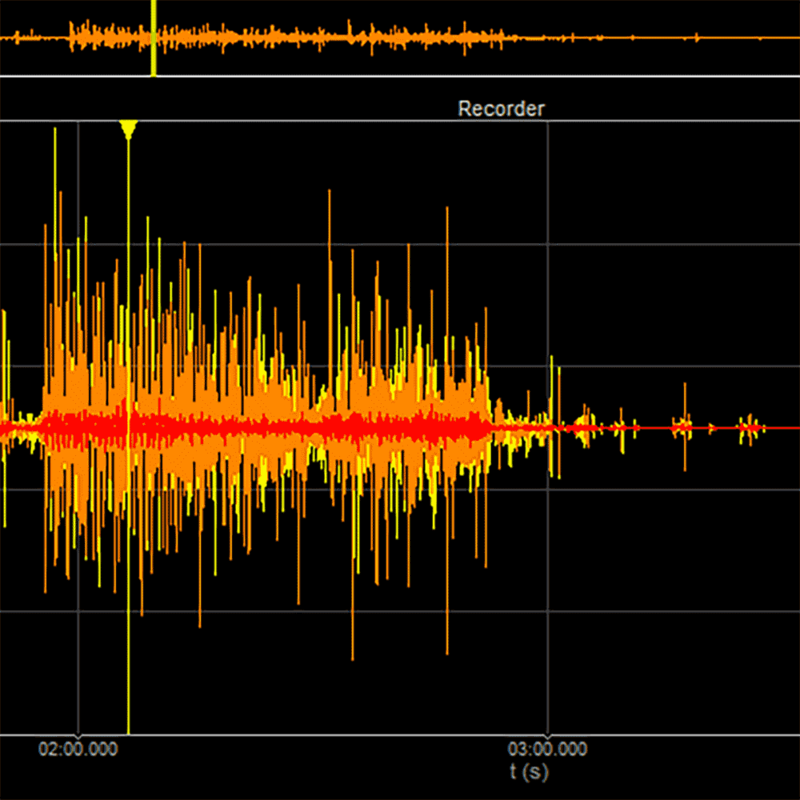 There is also a repeatability check and the visualization by third-octave band analysis for the report. For more information please visit Sound power measurement PRO training online course. Human body vibration module provides a measurement of the effect of vibrations on the human body. Especially in the working places exposed to high vibrations, there is a big chance of permanent damage to some parts of human body. For more information please visit Human vibration PRO training online course. ADAS: advanced driver assistance validation systems. Brake test: break test measurement, validation, and analysis according to international standards. Combustion analysis: measure and analyze parameters of internal combustion engines. E-Mobility: electric and hybrid car testing, including batteries, inverters and electric motor. 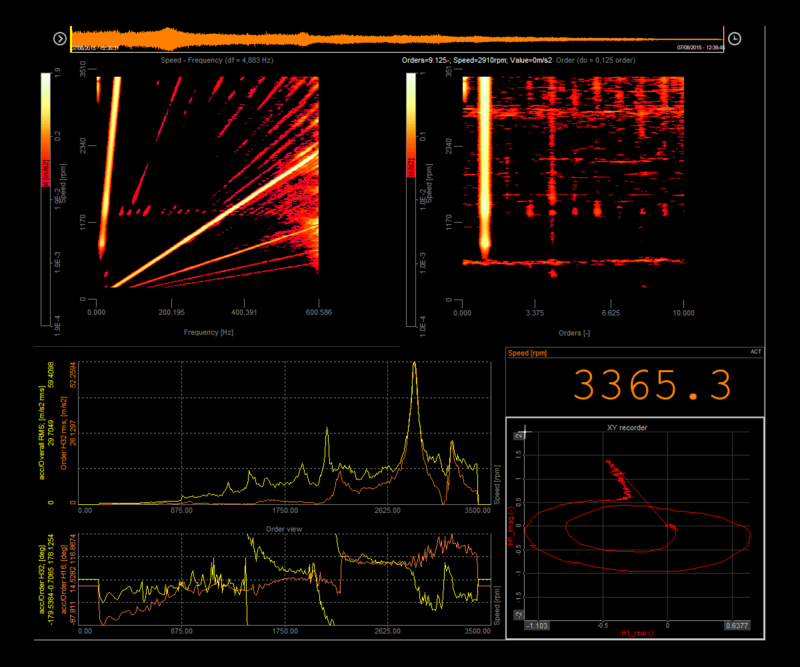 Pass-by noise: measure noise emission on all sorts of vehicles according to international standards. Dewesoft X together with our highly accurate GPS and IMU devices with latest GPS and RTK technologies provides a highly accurate and easy-to-use ADAS test system. Data from two or more vehicles provides very accurate position and distance information relative to each other and/or a fixed object. 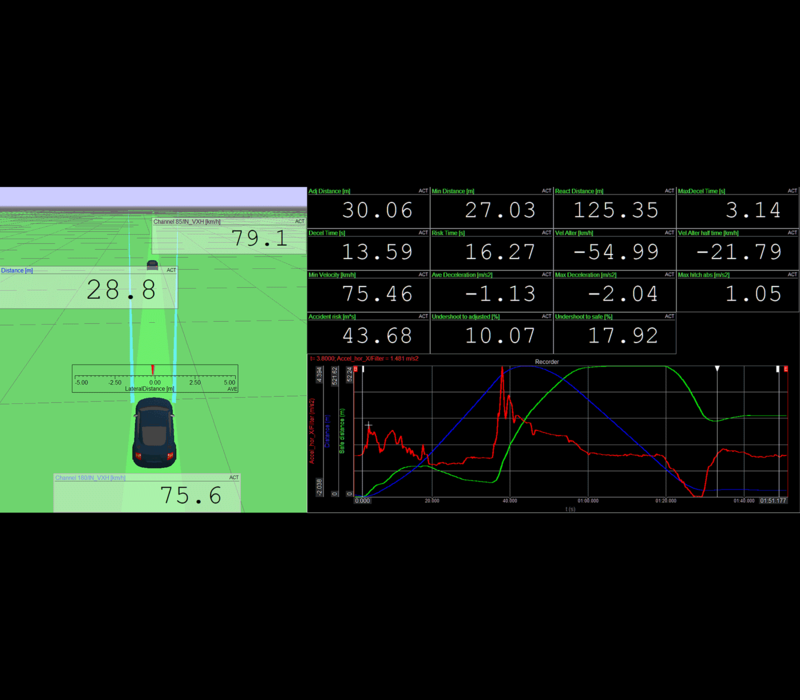 DS-IMU2 additionally provides accurate measurement of all vehicle dynamics, including side-slip angle. Polygon visual component: real-time car-to-car and car-to-object distance and time to collision calculations. 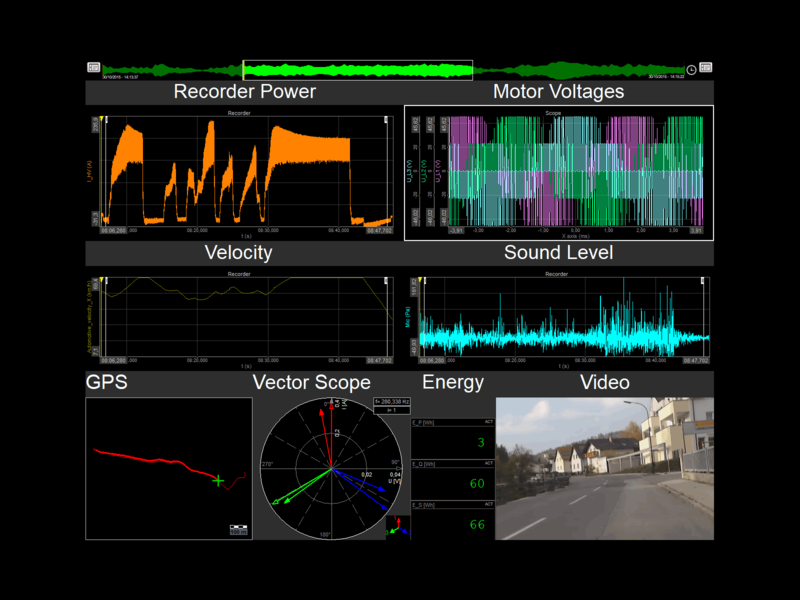 Many additional synchronized data sources like Video, CAN, CAM FD, FlexRay, XCP/CCP, OBDII, etc. Collision avoidance and autonomous breaking testing. Lane departure warning and lane assist system testing. Brake test module is very flexible and includes functionality for all kind of brake and ABS tests. It also covers tests for braking comfort and vehicles with regenerative braking. High accuracy GPS or IMU hardware is available to achieve the highest possible accuracy. Additional synchronized acquisition of other sources CAN, OBDII, J1939, FlexRay, XCP/CCP, Video, etc. The CA module can be used for engine research, development and optimization and also for component development and testing, such as ignition systems, exhaust systems, and valve control gear. Analog inputs for any sensor type with excitation. Charge, IEPE, Voltage, Strain, Torque, Temperature. Direct connection of any RPM sensor: InCar (e.g. 60-2), Encoder, CDM+Trg. 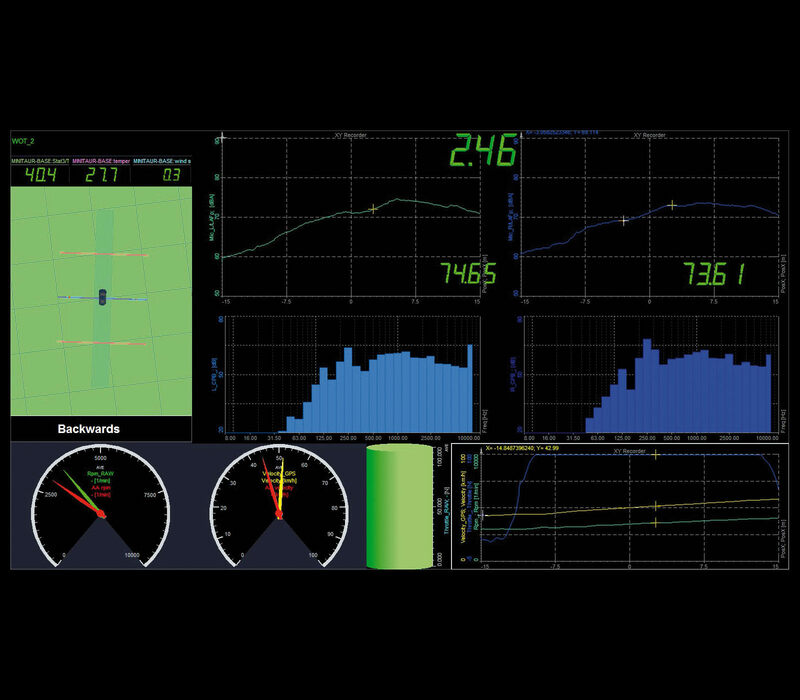 Multiple synchronized data interfaces CAN, FlexRay, Counter, GPS, Video, XCP/CCP and more. Simultaneous online analysis of torsional and rotational vibration, order tracking, electrical power, combustion noise, sound power and other mathematics. For more information please visit Combustion analysis PRO training online course. 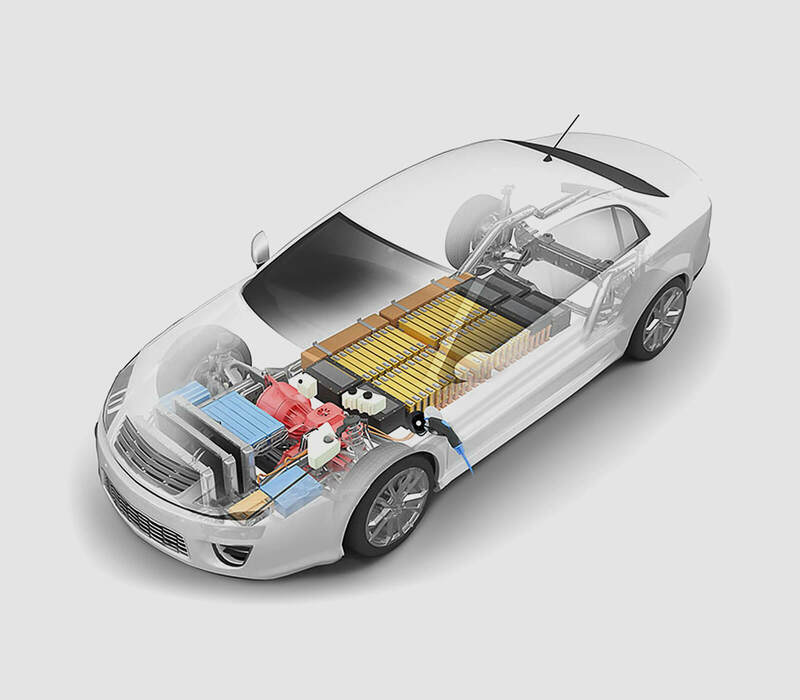 Power analysis module (see above) together with high voltage and the high precision current sensor provides all the functionalities for testing electric and hybrid vehicles. 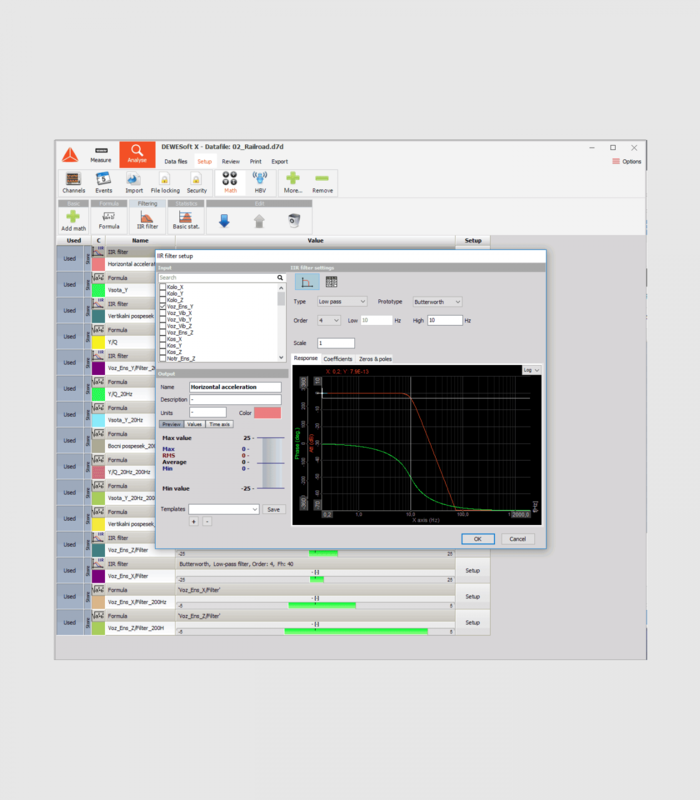 The big advantage is that the same system can handle analysis of other vehicle testing applications and can offer a total solution for electric and hybrid vehicle testing. Ability to acquire and analyze synchronized data from other sources: IEPE, strain gage, temperature, video, CAN, XCP/CCP, FlexRay, etc. within the same instrument. 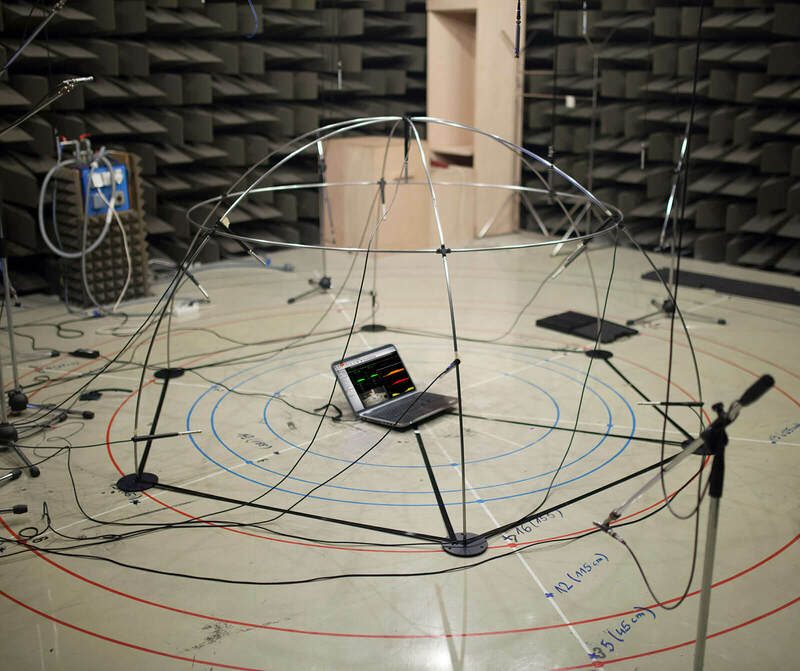 Pass-by noise module enables online check and validation for the pass-by noise test. Software functionality is fully supported with the hardware capabilities to form a total, easy to use solution. Vehicle dynamics module, so-called VTS, was developed together with Leane International and FCA group. The entire solution is based on top of Dewesoft X software and DAQ systems and offers support for standard maneuvers and quick pass/fail evaluation for the driver. 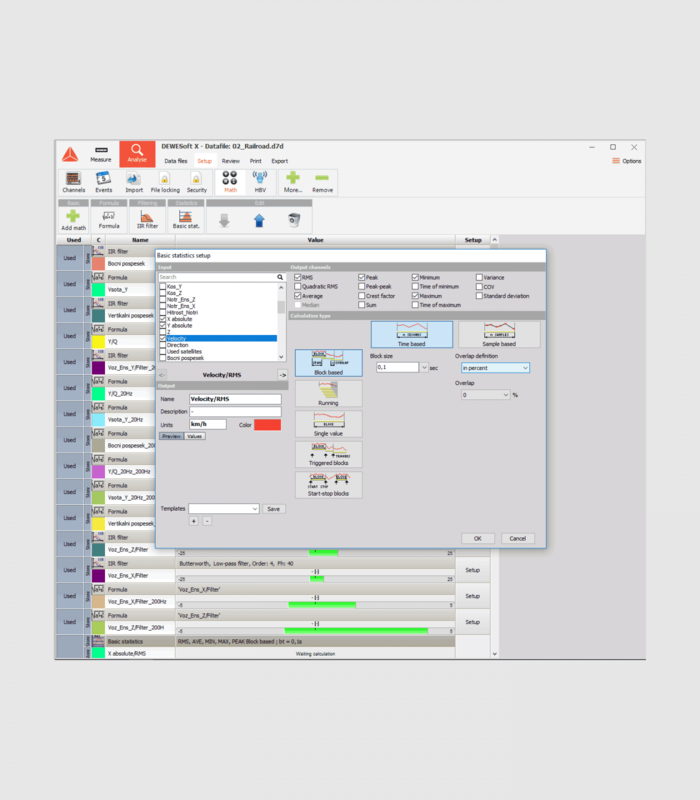 Dewesoft X allows to extend software with custom math and analysis features using DCOM plugin technology and your programming language of choice. Visit developers section for programming guide and example code. Go to Dewesoft X visuals page and learn about data visualization and available visual displays. Go to Dewesoft X publish page and learn about data export, presentation, and printing functionality.